I love Div. II stadiums... Well, really small college stadiums in general. I've found the smaller structures to be a lot more personal, and they also are easier to accompany oddities (such as SD Mines' Drive-In section) that just can't be implemented at a higher level. This thread is intended to share the love. Post anything related to Div. II stadiums. Photos are the best, but news, stories, general discussion, history, random facts - It's all welcome! I'll get us started with a photo of my home field, the Regional Event Center in Marshall, MN. Home to the Southwest Minnesota State University football program. It's a different angle than what's usually shown, as it's taken from the far endzone. 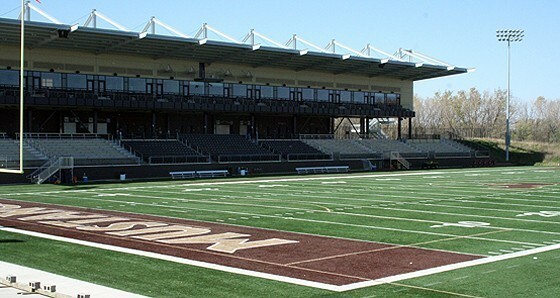 The stadium opened in 2008, and is home to SMSU's football and soccer teams. The softball team also utilizes it. In addition, it's home to the local high school football and soccer programs, used by the MSHSL for football playoffs, and hosts marching band competitions. The building off in the distance is the R/A Facility, home to Mustang men's and women's basketball. I took this photo on 10/6/18. It's a game against the University of Minnesota-Crookston Eagles, and it's also homecoming. The Mustangs would be the victors winning 55-6. 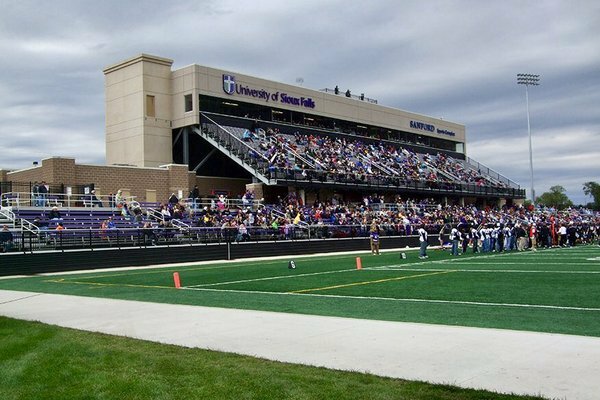 Our claim to fame at SMSU is that we not only have one, but two football stadiums on campus. This is the original SMSU football stadium, Matke Field, that was used through 2007. It sat dormant for 7 years until being re-purposed into a track and field facility and re-opened in 2014. The football field and goalpost were also redone, however there's never been a game hosted here that I am aware of since it's reopening. I attended games there and drive by it on 23. I didn't realize it was that nice. I would think that they could have some high school games there. To add to SW Mustangs info. The track stadium is a huge benefit to the football program as it provides a back-up, turf practice field with lights when other university events are taking place at the regional event center. Special teams also can use this field with the goal posts and fully lined surface. In addition, SMSU also has two grass practice facilities that they rarely use but have in the past in preparation for Mankato and Crookston. The Victory Bell is at the bottom of the video scoreboard and is a nice gathering spot after games. The Bill Snyder Pavilion is a nice addition this year - it's serving as a "party deck" with food and beer vendors. I'm sure they could. I know SMSU soccer has played back there in the past. I could be wrong but I don't think they did much with the press box, so it would have the same capabilities it had when it closed. I made it out to the Blake this year. Holy cow. I love that stadium. I could see everything. I should probably show the actual seating sections themselves, whoops. I got this one off of Google. I've made the trip down to USF twice. I love their stadium. Temp at kickoff for week 3 this year was 91. Another one from Google. Best place to WATCH a game. Love the berm. Beautiful grass field. But it does need replacement. The place needs a ton of work, but there's no better place to see a game I'm convinced. I sat high up, close to the 45 or so on the near endzone, and I could see everything. I know replacement has been a topic of discussion in the past, what's the current status? Last edited by SW_Mustang; 10-09-2018 at 06:20 PM. I was just at Pittsburg State this past weekend, and was in the upper deck. Fantastic sight lines. Has to be one of the best stadiums in D2, if not the best. While Northeastern State’s stadium needs some updating, the sight lines in Doc Wadley Stadium are also really good. Ain't happenin' for awhile. Just got the locker room project OKed- announcement the night of the Southwest game. They want a new scoreboard. But the Taylor Center could use one of those too- Southwest has a far better one for both football and basketball. I'm hoping for some sugar daddy to come through. But from what I have learned, it isn't quite so easy. I think an obscenely gigantic video board would be awesome. Where are the locker rooms going in at? Wouldn’t make sense to spend money on a new scoreboard if the stadium needs to be replaced. Spend it at the facility that still has a lot of life left (Taylor Center). Across the street near the indoor track facility. That is what I thought. Also- the stadium is built on the northwest-southeast line. It needs to be straightened out to north-south. Part of the problem is the age of the scoreboard. They don't make replacement parts anymore. I don't think that they can even replace the lightbulbs. Maybe we will return to a manual one like at Fenway. Ian can attest that we have an annual MIAA stadium rankings thread on our forum. I love visiting college stadiums. It's been a hobby for a few years. Here is my photographic resume of the places I've been to, from FBS to NAIA. There are more than 60 D2 stadiums in there. Awesome pictures, Chuck. It's interesting to see all those stadiums, some very tiny, some enormous, some with personality, some bland. Great collection.